Despite being one of the busiest conductors on the international scene, Tilson Thomas has devoted considerable time to composing throughout his career. His From the Diary of Anne Frank, for narrator and orchestra, was commissioned by UNICEF and given its world premiere at Philadelphia's Academy of Music in 1990 by the late Audrey Hepburn and the New World Symphony, conducted by the composer. His most recent work, Four Preludes on Playthings of the Wind, received its world premiere in Miami in April 2016 with the New World Symphony and soprano Measha Brueggergosman. 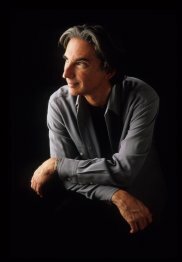 Other recent compositions include a song cycle on Emily Dickinson's poems, premiered by the San Francisco Symphony in February 2002, performed on their 2003 European tour and 2005 American tour; Urban Legend, for contrabassoon and orchestra, first performed by the San Francisco Symphony in October 2002; Three Poems by Walt Whitman for baritone and orchestra; Five Songs, for voice and piano, including We Two Boys Together Clinging, recorded by baritone Thomas Hampson and pianist Craig Rutenberg for EMI; Street Song, written for the Empire Brass Quintet and also available in a version for symphonic brass; and Agnegram, the composer's short (4') 90th-birthday orchestral tribute to longtime San Francisco Symphony patron Agnes Albert. Described as buoyant and exuberant with shades of Stravinsky, Walton, Bernstein, and Spike Jones, Agnegram was premiered by the San Francisco Symphony on 14 May 1998.